This review first appeared in October 2014 issue of high-end hifi magazine fairaudio.de of Germany. You can also read this review of Accustic Arts in its original German version. We publish its English translation in a mutual syndication arrangement with the publishers. As is customary for our own reviews, the writer's signature at review's end shows an e-mail address should you have questions or wish to send feedback. All images contained in this review are the property of fairaudio or Accustic Arts - Ed. Are you easily seduced? No, I’m not talking about an extra evening beer or a second piece o’ cake. I mean something more substantial that might change your life. Well, at least your hifi existence. My last temptation of this kind doesn’t date back that far. 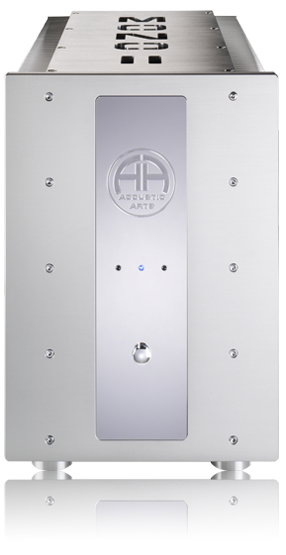 In the spring I’d taken the measure of the Accustic Arts Tube Preamp II and found it exceptionally suitable. Suitable? Well, the thing had everything I wanted: plenty of socketry, balanced valve circuitry, top fit’n’finish and sound to… well, just read the review. It’ll tell you why I couldn’t let it go. No cheap pleasures, mind, but worth every cent. And now the firm followed up with a fine mono amp called, simply, Mono II. Devil in a red dress? Sure felt like it. Once I’d liberated the monoliths from their shipping cartons, I had a small reality check. Until now, Accustic Arts have amassed some pretty hefty stereo amp specimens in their portfolio, of the sort which pains my biceps just looking at their impressively chromed fascia inlays. On the carpeted floor of my listening room, the two monos meanwhile looked anything but monumental and closer to petit. Then their optics were dominated by heat sinks. Granted, 25 kilo per ain’t cardboard. Given the brand, it simply didn’t seem properly macho. This new understatement, I was told, ups the ol’ WAF quotient. Presumably that didn’t count for too much with their massive AMP II and AMP III stereo amps. That said, with the monos solidity didn’t go AWOL. Thick aluminium panels with the company’s signature chrome trim and a precisely machined Mono II cutout on top instantly mirror the Schwabians’ high standards. Those extend to the business end where biwire devotees are catered to. Practicality gets its due with a mute switch which enables noise-free cable swaps without powering things down. This delights a reviewer’s heart. Ditto the option to switch the monos for RCA or XLR signal input. Even through the jeweler’s loupe, finish and trim showed no cause for criticism. Today that’s not a given. Even the power mains was in easy reach on the front where it belongs. It’s logical that a €12’500 proposition wouldn’t play it fast and loose on perfection. And so this firm delivers. To match the sonic experience with the attractive cosmetics, Accustic Arts have called upon proven solutions. Those who’d correlate their substantial real estate of cooling ribs with solid power wouldn’t be completely wrong. The Mono II isn’t shy and delivers 300 watts into 8Ω. Even critical loads are catered to with 700 watts into 2Ω. To accompany those ratings with proper current, each channel gets a 1.2KW power toroid. Attendant filter capacitance of 80’000µF ought to be properly sufficient. Valves as in the Tube Preamp II are MIA. Here the output devices are transistors and Mosfets in particular. Each channel gets 12 stringently selected parts which explains the impressive output rating. 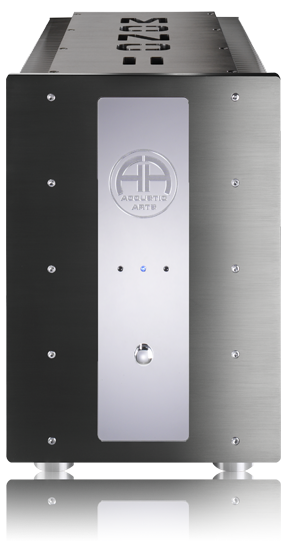 The circuitry is based on the proven well-reviewed stereo AMP II, a balanced class A/B affair with very high current output to support challenging low-impedance loads. The firm’s comment that each Mono II is essentially half an AMP II is overly nonchalant given that the surcharge over the €10’300 stereo amp wouldn’t just buy twice the casings.